Royal Portrush Golf Club at the top of the Emerald Isle is the only Irish golf course to have hosted a British Open (1951, won by Max Faulkner). It remains a stern championship test, if slightly easier than its notorious compatriot Royal County Down (with which it makes a fine one-two golf-trip punch). Opened in 1888, the club became royal four years later with the patronage of the Duke of York. In the decades immediately thereafter it saw a number of improvements but has remained largely unchanged since the 1930s. It consists of two links courses, the more famous Dunluce and the Valley, which play on flatter, lower terrain. The Dunluce starts off inland with a few relatively bland holes. Things get interesting at the fourth green, and by No. 5 you find yourself in the middle of incredibly dramatic links terrain guarded by the magnificent Curran Strand. The 14th, aptly named Calamity, is a shocking par 3 that plays over a deep abyss to the right - it's where slicers go to die. The 17th is marked by the infamous "Big Bertha" bunker, the largest sand trop in Ireland. It lies to the right of the fairway and is a sight to behold. Royal Portrush is the only Irish course to have hosted the British Open. Royal Portrush starts inland but reaches full-fledged links glory by No. 5. A pair of dunes protect the fourth green at Royal Portrush. 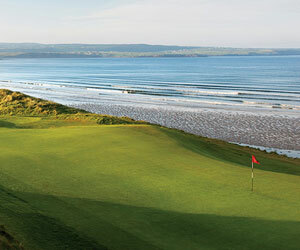 The Curran Strand to the right is a major fixture of Royal Portrush's Dunluce Links. It's easy to see why Royal Portrush's No. 8 is called the Himalayas. Slices die in the abyss on No. 14, aka Calamity. "Big Bertha," Ireland's largest bunker, lays in wait to the right of the 17th fairway.